How will the student portion be submitted to you for evaluation? 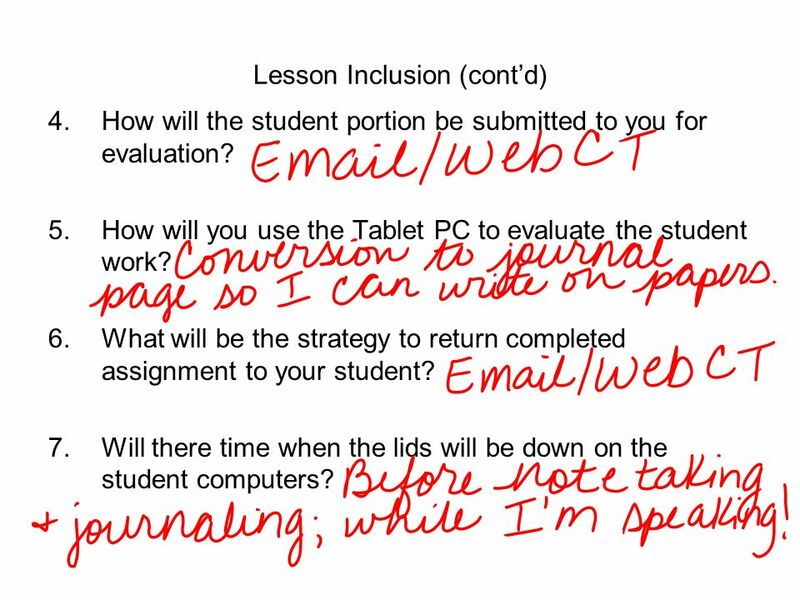 How will you use the Tablet PC to evaluate the student work? 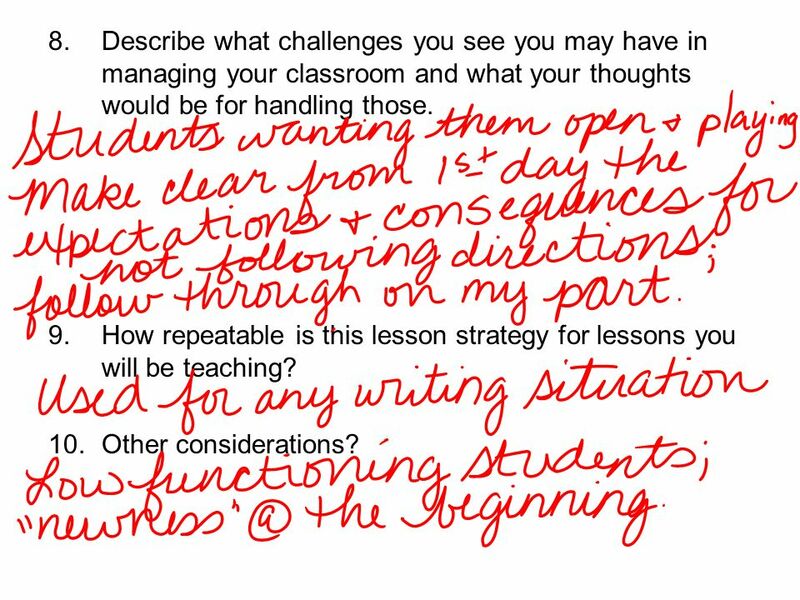 What will be the strategy to return completed assignment to your student? Will there time when the lids will be down on the student computers? 3 Describe what challenges you see you may have in managing your classroom and what your thoughts would be for handling those. How repeatable is this lesson strategy for lessons you will be teaching? Other considerations? 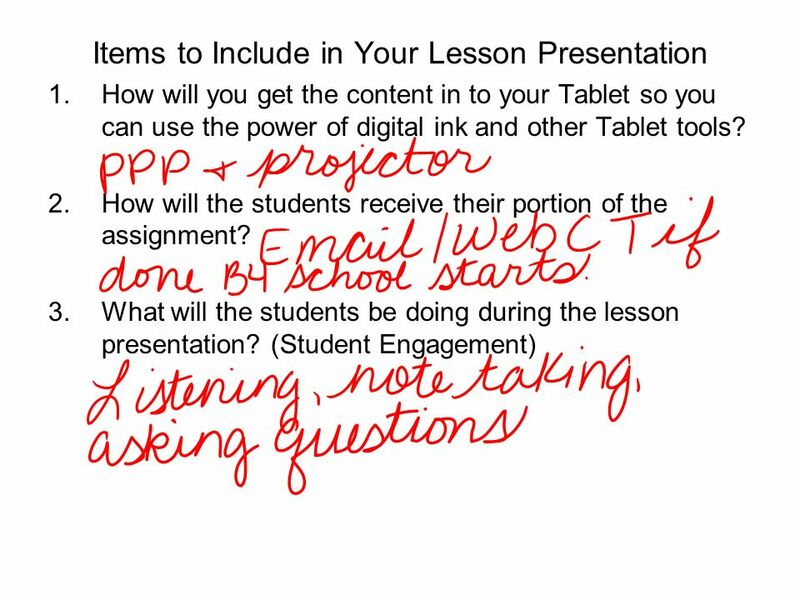 Download ppt "Items to Include in Your Lesson Presentation"
Professional Development May not be duplicated without permission Final Assignment: Stem Cell Research My final assignment is a WebQuest. The URL of my. WebQuest: WebElements.com. Objectives: Students will use WebElements to find specific information about the elements. Students will develop 21st century. Computing Basics Understanding the components, history and impact on todays life. Krista Sweckard, Newell High School. Classroom Connections Professional Development Content Symposium July 31 - August 1, 2006 Lorie Johnston High School Math Newell High School. Content Symposium Lesson Christina Strid Corsica Public School. Professional Development May not be duplicated without permission Final Assignment. The U.S. Constitution Integrating the Past with the Future Dave Ohrtman Kadoka High School. Metrics for Physical Science The Easy Way: The Easy Way: Learning Learning the Metric System and Conversions the Metric System and Conversions Utilizing. Multi-cultural Mask Art Project Lesson Plan. Designed by: Sharon Johnson Mitchell Senior High Grade Level: High School Estimated Time: 5-6 ninety minute. Introduction to Art Class What is art?. Lesson Objectives Recognize that art today includes an extensive variety of forms produced with many different. Content Symposium Lesson Physical Science Matter. Mr. Chad Eisenbraun Personal Finance Creating a Personal Monthly Budget. Environmental Science Pollution and Superfund Sites Environmental Science Pollution and Superfund Sites Betsy Burtzlaff Newell School District. Indicator 3.10 part II Employ product-mix strategies to meet customer expectations. Introducing Students to UDL Dr. Katie Novak Assistant Superintendent of Curriculum and Human Resources Author of UDL Now!